We have been really busy around here lately cleaning up the house. I love the holidays and all the the activity it brings, but afterwards, you just feel like you need a complete housing cleanse! Also, I wonder...if we spring clean now, will it bring spring here any faster? I hope so! Things have been pretty simple as far as food goes, lately. When we are really busy, we keep things quick and basic. That being said, there is not a whole lot of cooking going on unless it is a throw together and leave it kind of thing. As some of you know, I am very thrifty. So, I am always looking for a less expensive way to do everything in the kitchen. I have also discovered my extreme love of the pressure cooker, especially when I cook beans. In fact, I think my pressure cooker has become my bean factory! I can buy a 1 lb. bag of chickpeas for $1.59. This bag will give be about 6 1/2 cups cooked chickpeas. That is a great deal if you ask me. This saves me time and money! 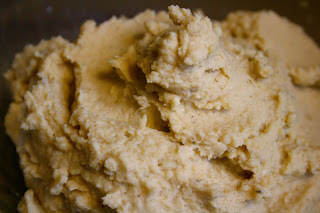 We always have these on hand since hummus is a great healthy snack or meal and we eat a lot of hummus around here! You know how your mom used to tell you not to lick the knife when something good was smeared all over it? 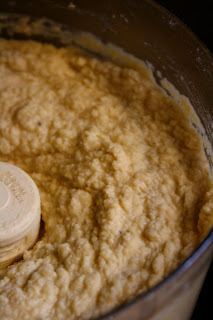 Well, I have to remind myself of that when I make hummus...don't lick the blades! Anyway, I know a lot of people are afraid of pressure cookers. They have seriously come a long way and if you follow the directions that come with your pot, you really can't go wrong. They really are a great tool in the kitchen that will ultimately save you a lot time and money! Soak chickpeas over night (or at least 8 hours) covered in water in the fridge. Next day, drain off the water. 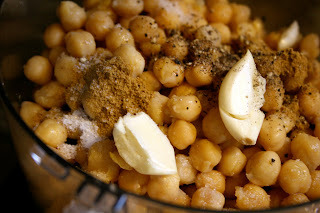 Put chickpeas in the pressure cooker. Cover with water until it is 2 inches over the beans. (I normally measure out how many cups of soaked beans I am putting in the pot and then do 2 extra cups of water. That normally does the 2 inches for me.) Seal with the lid. Turn the stove on high to bring to pressure. When the top starts to toddle or it comes to full pressure, turn down to medium high so it toddles at an even rate. Set timer for 15 minutes. When it is done, turn it off and do a quick pressure release. I have to put mine under cold water until the release button goes down, but you should follow your manufacturers instructions on this. Your chickpeas are ready to be seasoned. I like to season beans as I go since I never know what I am going to use them in. Note* Don't salt beans until they are done cooking. It makes them tough if you do. Can you believe I've never actually "cooked" chickpeas before. I always buy the canned stuff. These looks delicious! I always buy the canned chickpeas...sad, right? You're absolutely right that it would be so much cheaper to buy it in a big bag and cook it as I need it. I could eat hummus with pretty much ANYTHING. Thanks for this helpful post - it's about time I started making my own hummus! PS: Mind if I add you to my blogroll? You have some great recipes! Thanks Gabriella! I would be honored for you to add me to your blogroll! By the way, I love your name!